From my early childhood I have been fascinated by nature and the peace and quiet found only in the mountains. I searched for adventure on foot, on skis and on a mountainbike. 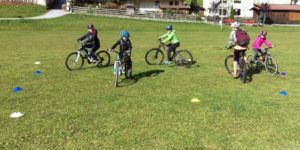 (Mountainbike Schule Wildschönau Tirol). In particular mountainbiking had a profound effect on me. During the summer months I love the freedom found in remote corners of the region. 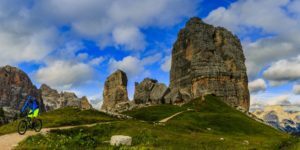 I’ve become passionate about discovering something new on every single tour; a breathtaking view, a wild animal, a quaint mountain hut or testing an undiscovered flowing trail. The kick is also being able to conquer every trail, to master each hurdle and getting an adrenalin high before savouring the sense of happiness and achievement at a quaint mountain hut afterwards. Every mountainbiker from every aspect of the sport; the tour biker, the collector of altitude metres, the cross country biker, the downhill biker, children or e-bikers can all come along with me to find that sense of peace, unspoiled nature, flowing trails and the adventure and fun of this outdoor sport. An increasing number of mountainbikers need the thrill of the descent. More and more trails with technically difficult passages have to be conquered – all without getting off the bike. The problems start when bikers don’t possess the necessary skills. My reputation as a bit of a technique freak means that I, as a trainer am a perfectionist in biking technique. I always try to use the correct method even on the most demanding stretches. It is my aim to pass on this knowledge to my course participants so that they can benefit from it on their own rides. 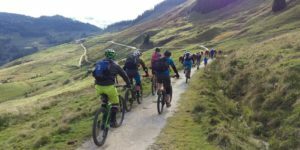 E-bikes are revolutionising the mountainbike sport. 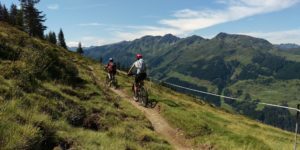 With an e – mountainbike, the ascent to a favourite hut or peak is possible for everyone; seniors, sport novices or even those recovering from illness or injury can „get back in the saddle“ and enjoy increasing fitness and well-being. For e-bikers riding downhill can be a challenge because of the weight of the bike. Steep descents and gravel roads cause the most problems and bikers can quickly lose control. I offer a specially designed course to correct just this problem. With the right technique even the steepest routes needn’t spoil your fun. 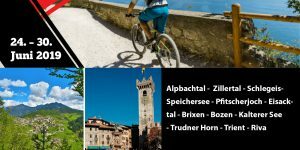 In my Wildschönau Mountain Bike School I guarantee 100% fun and adventure, with ‚E‘ or without, uphill or down! GIFT VOUCHERS available for all services!